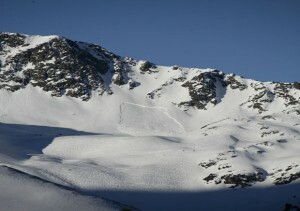 On Saturday afternoon, five snowboarders lost their lives after an avalanche they apparently triggered in the backcountry at Loveland Pass in Colorado, fell on them. Search crews and rescue personnel recovered the five bodies a number of hours after the avalanche. The slide was over 600 feet wide with snow that was up to eight feet deep, Sheriff Don Krueger of Clear Creek said. Another snowboarder who was caught in the same avalanche survived after digging himself from the snow and calling for assistance. It was not known what that snowboarder’s condition was. Each of the other five snowboarders wore avalanche beacons. The Transportation department of Colorado closed U.S. 6, which is used to cross the Continental Divide and runs close to where the avalanche took place, to help make the search easier. That section of U.S. 6 is heavily travelled by skiers traveling to resorts nearby. Kreuger said local authorities are almost certain the avalanche was triggered by the snowboarders, which he said traveled over 1,100 feet. The tragedy occurred on a weekend in spring when many snowboarders and skiers took advantage of snowfall late in the season throughout the Rockies. Four or more ski resorts in Colorado reopened this weekend following a big snowstorm during the week. Authorities said that since January, weak layers of snowpack in Colorado have been present and with new snow, they become more active. Over the past week 18 inches of new snow has fallen making it a heavy load on the already weak snowpack. The number of deaths, this season, due to avalanches reached 24 in the U.S., with this five snowboarders.